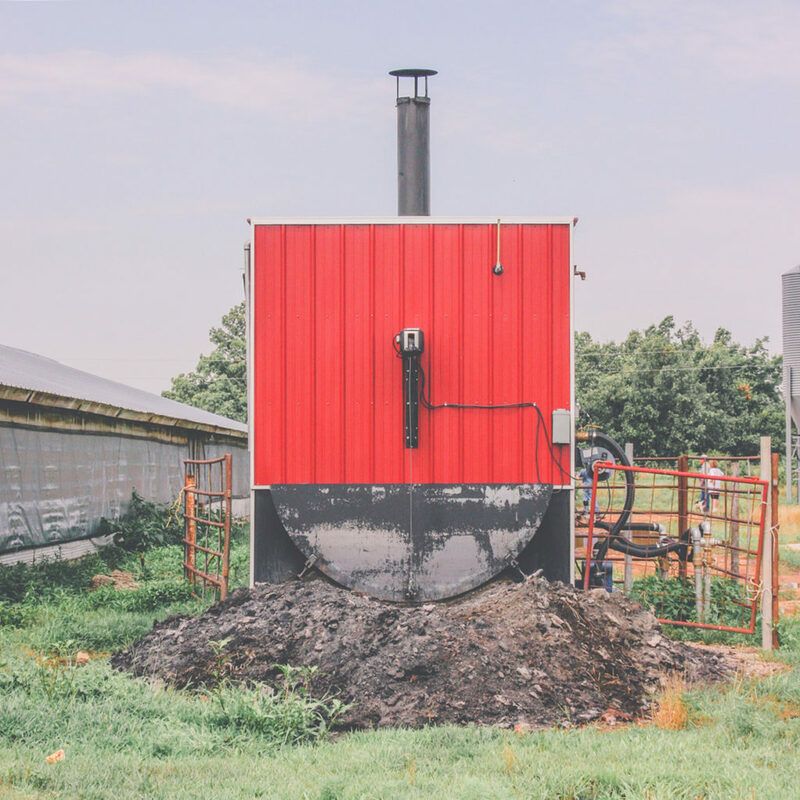 The AGRI-FLAME is a large bale, multi-biomass fueled, hydronic stove designed to supplement the normal propane or natural gas heating systems and ultimately reduce the heating costs of livestock houses and green houses. 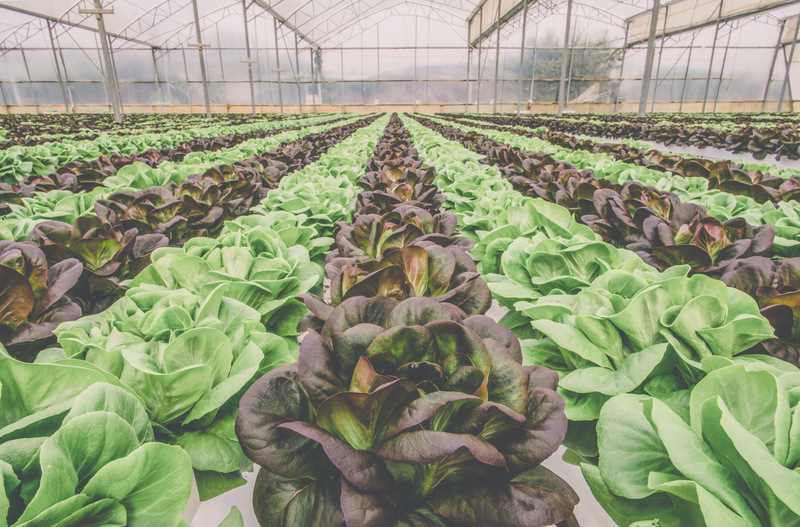 Our patented design takes full advantage of the resources available to farmers and requires considerably less use of more costly energy sources. Until now, a stove of this magnitude has not been available for purchase. 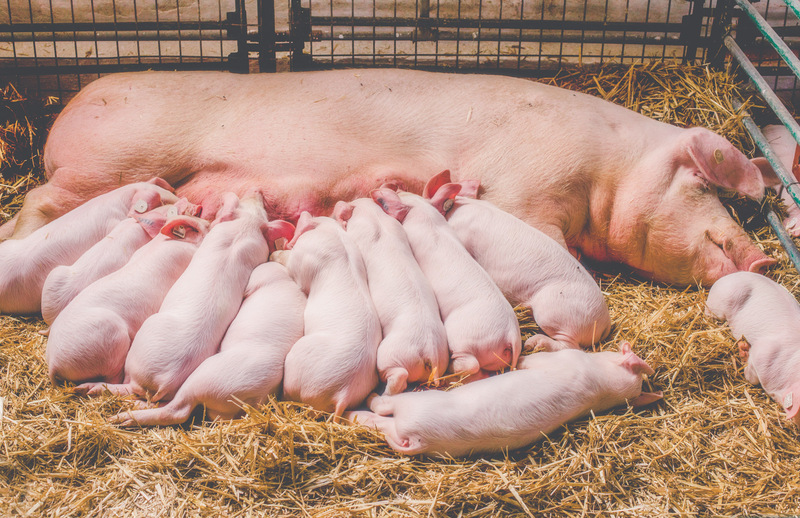 Over the years, the cost of propane has risen exponentially, and the cost for growing livestock in a controlled environment has risen along with it. In the past, growers have been able to make enough profit throughout the summer months to withstand the winter storms, however, this is no longer achievable. For most of today’s growers, fuel costs are rolling over into the next year, making the years ahead even harder. 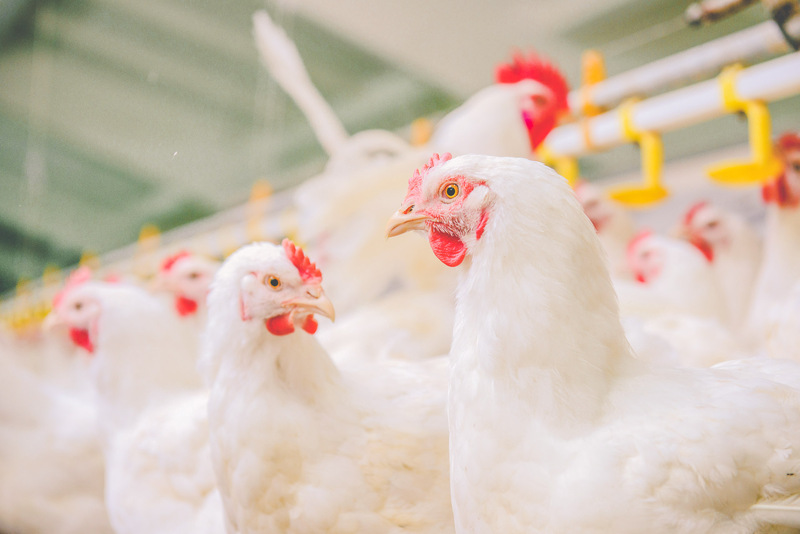 Having been in the poultry business for over forty years, we have experienced all of these changes and understand the burdens of heating costs on growers. 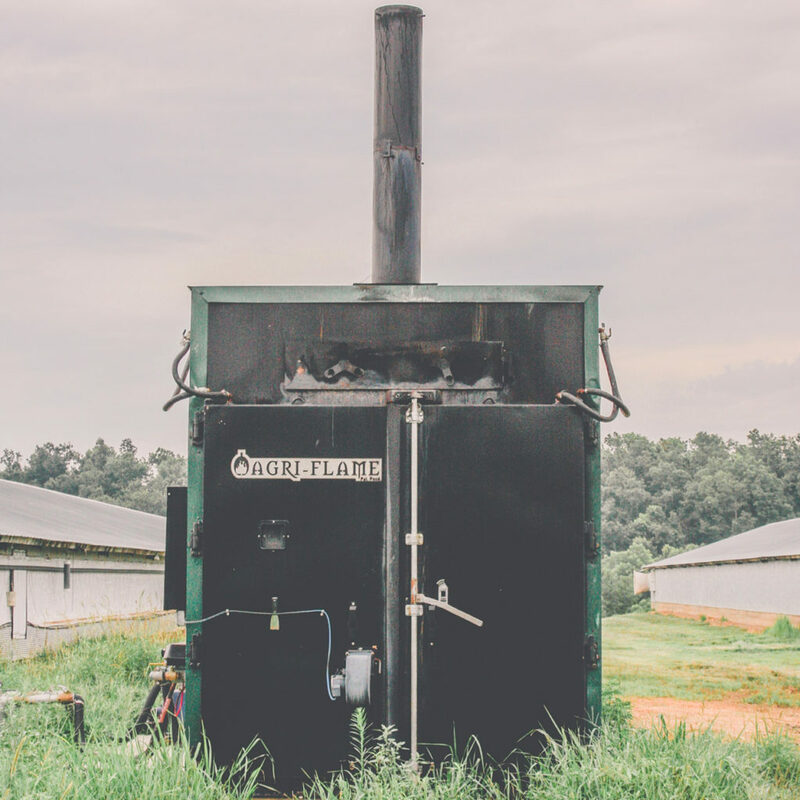 The AGRI-FLAME evolved in 2005 after receiving a $18,000 gas bill for one flock of birds. That bill inspired us to search for a more cost effective solution to heating our houses. Thus came the idea of burning hay as a fuel source. In our inquiries, we found that we were not the only ones looking for an alternative energy source. 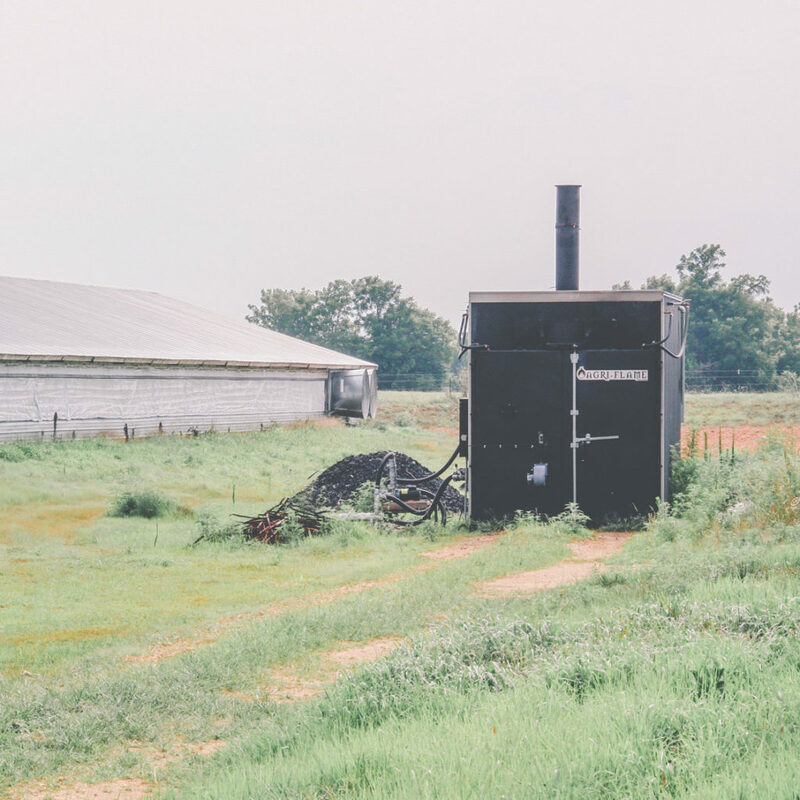 We found other innovative growers who had built their own on-site units out of large tanks or railroad cars. However, a stove of this kind could not be bought anywhere in the U.S. or Canada, leaving growers who could not build their own, in the cold. Since we could not buy a stove, we decided to take on the task of building our own. We soon learned that the system inside the houses and the plumbing was just as important as the stove itself. Through trial and error, and information gathered from other systems, we were able to design a system that met our particular needs. 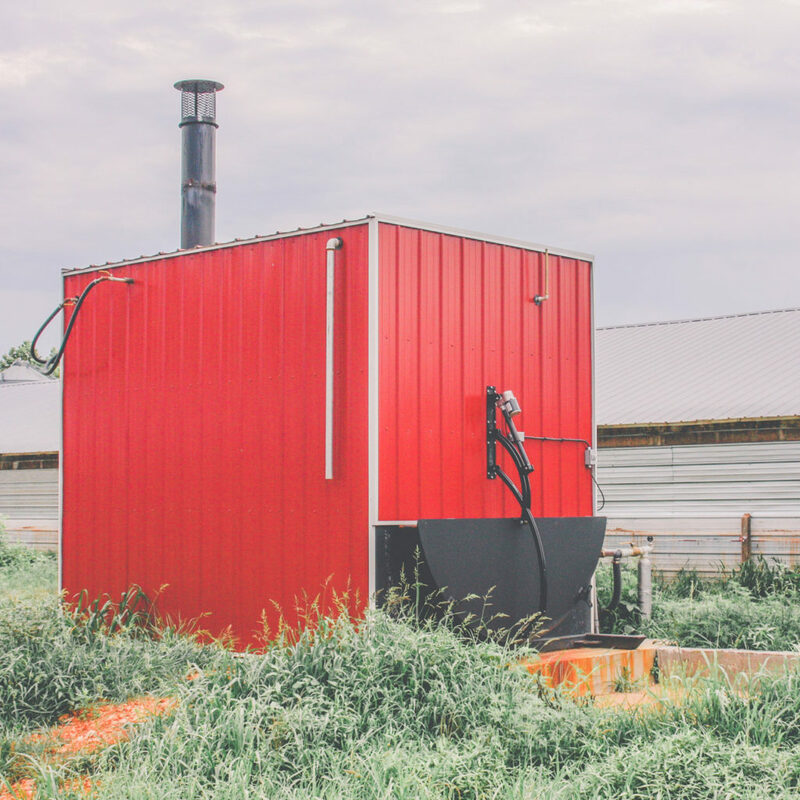 After testing the stove and system on our own farm and a neighboring turkey farm for several years, we ended up with a system that is simple and proven in design and payback. The AGRI-FLAME is designed to heat with any dry bio-mass bale, but can also burn saw mill waste in log or bundled form. These renewable fuels are burned inside the stove to heat almost 4000 gallons of water which is then circulated to the houses through a series of radiator units that transfer the heat into the houses, reducing the need for heat from other sources. The design of our in-house system allows you to place heat where you need it and to work with your zones rather than against them. You can shut down radiator units to provide more heat on the brood area and turn on radiator units to provide more heat in areas of turn-out. 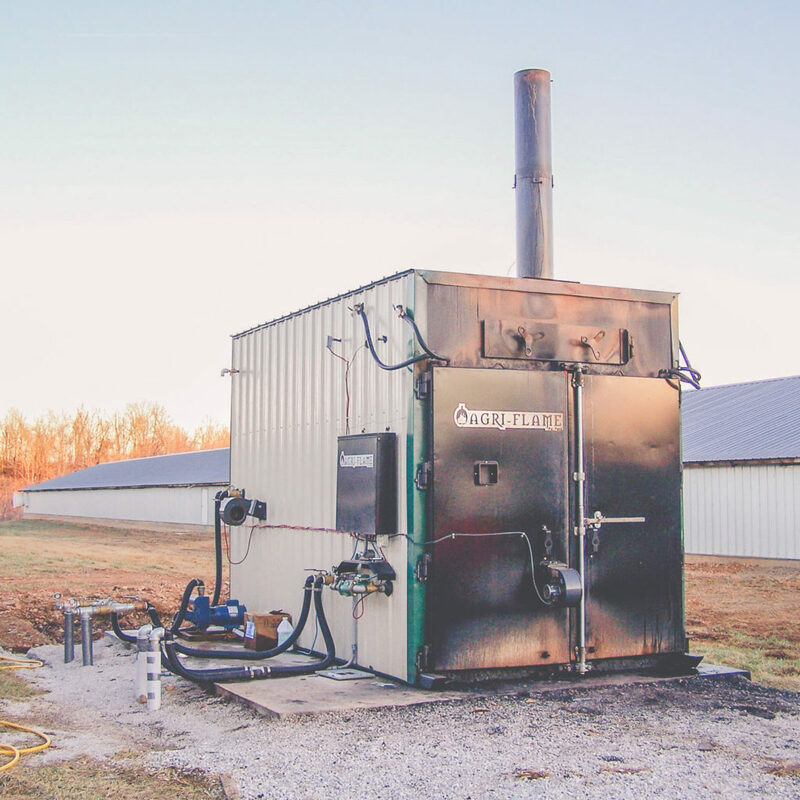 The remainder of the renewable fuel burned matter can easily be pushed out of the stove through the chute in the back and may then be used as a fertilizer in certain applications, reducing waste even further. It’s put a lot more money in my pocket. It’s pretty well paid for itself already and it makes growing chickens a lot more enjoyable. The benefits are that I’ve saved in propane and it keeps my houses dryer. That’s a big plus right there! I believe [the AGRI-FLAME] has improved house conditions dramatically. Our north walls were dry this winter compared to winters past. The living condition of the birds was better, too! [The AGRI-FLAME] puts the profit back into raising chickens, and I think it makes for a better bird. We’ve come in #1 five out of six [times] since we’ve had the stove this past year! AGRI-FLAME stoves are built to burn a variety of environmentally friendly fuels. 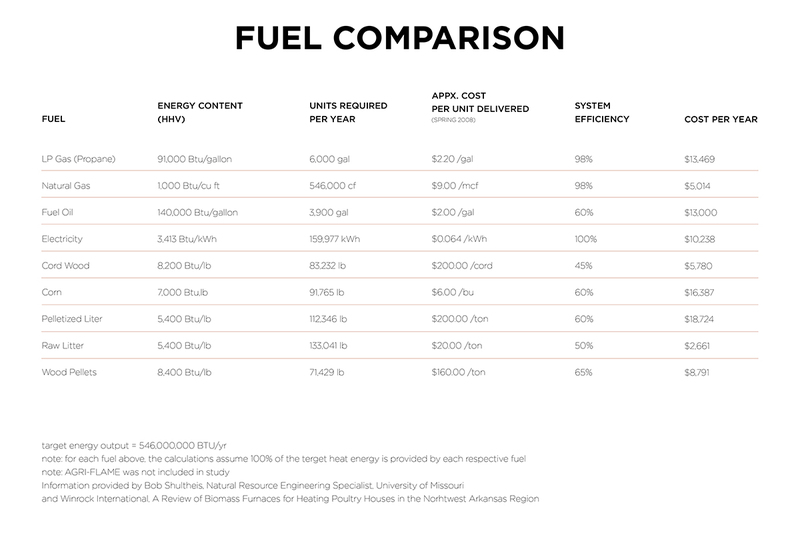 This flexibility allows you to burn the most readily available and affordable fuel in your area. Burn any dry bio-mass fuel in bale form such as hay, weeds, straw, switchgrass, Johnson grass, corn stalks, bean stubble, fescue stubble, etc. Burn wood, such as sawmill waste, in bundled slab form or in log form, or burn your own log waste. AGRI-FLAME has partnered with a select group of lenders who not only understand the substantial savings potential of our product, but who also understand the financial commitment and constraints of the American farmer. We will be glad to work with you to find the best possible options for financing your AGRI-FLAME system. 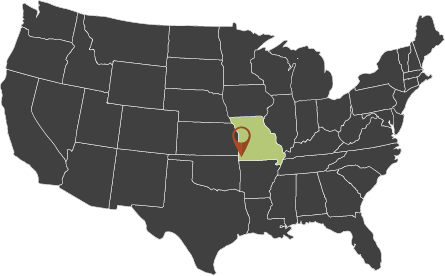 The United States Department of Agriculture (USDA) offers grants and loan guarantees under the Rural Energy for America Program (REAP). The USDA’s REAP program provides grants and loans to rural small businesses and agricultural producers for the purchase and installation of renewable power projects. The AGRI-FLAME qualifies for this program! Get renewable energy or energy efficient grants up to 25% of the eligible product cost! Get a loan guarantee for up to 75% of the eligible project cost! For more information on grants and loans, contact the USDA Rural Development Rural Energy Coordinator in your state or visit www.farmenergy.org. We can assist you with completing the necessary grant applications and provide the required AGRI-FLAME product specs and data. Where is the AGRI-FLAME made? 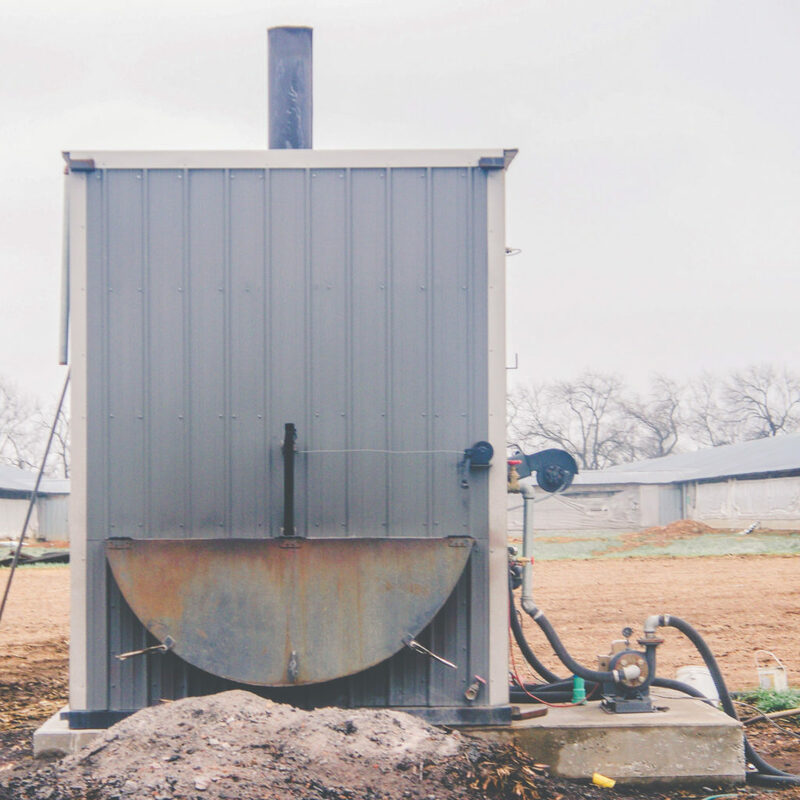 The AGRI-FLAME is designed and marketed by B & D Heating Systems, LLC, of Diamond, Missouri, and fabricated in Topeka, Kansas by Topeka Metal Specialties. What fuels can I burn in the AGRI-FLAME? The AGRI-FLAME can burn hay, Fescue stubble, cornstalks, wheat, straw, Johnson Grass, etc. –any bio-mass in bale form with a moisture level of 15% or less. 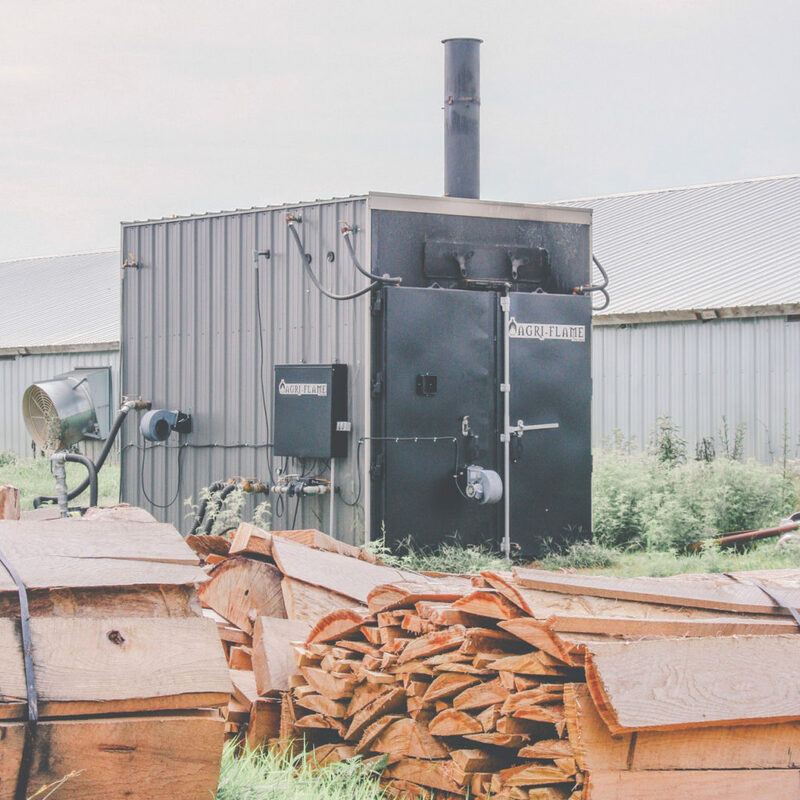 The AGRI-FLAME can also burn bundled slab wood. How long will one bale burn? 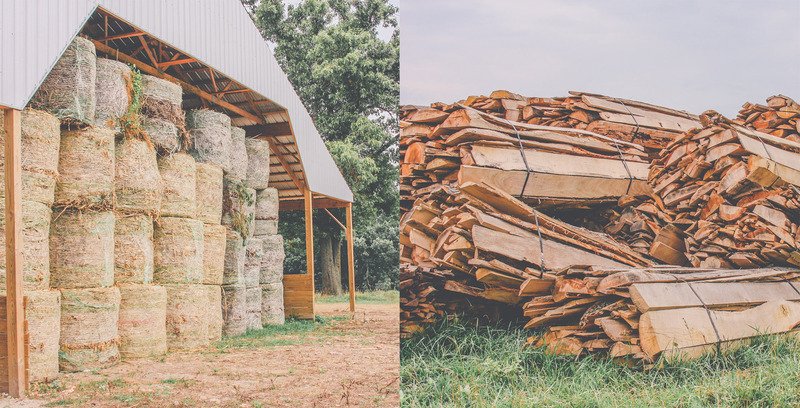 Under a full load, (with fans operating) one bale will last approximately 6 hours. 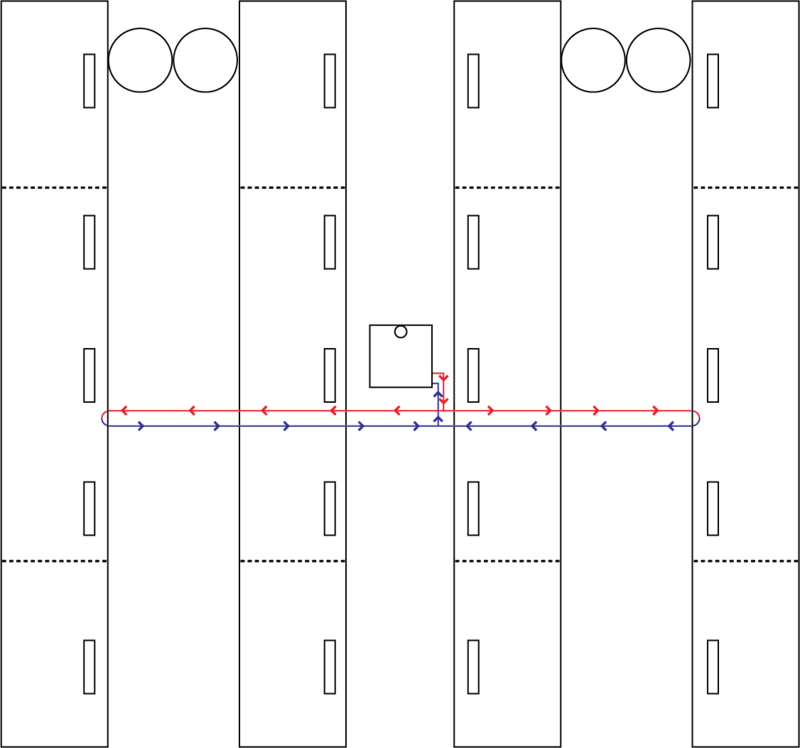 If the water reaches it’s designated maximum temperature, the fans will shut off and the burn time will increase. How many houses will one AGRI-FLAME heat? 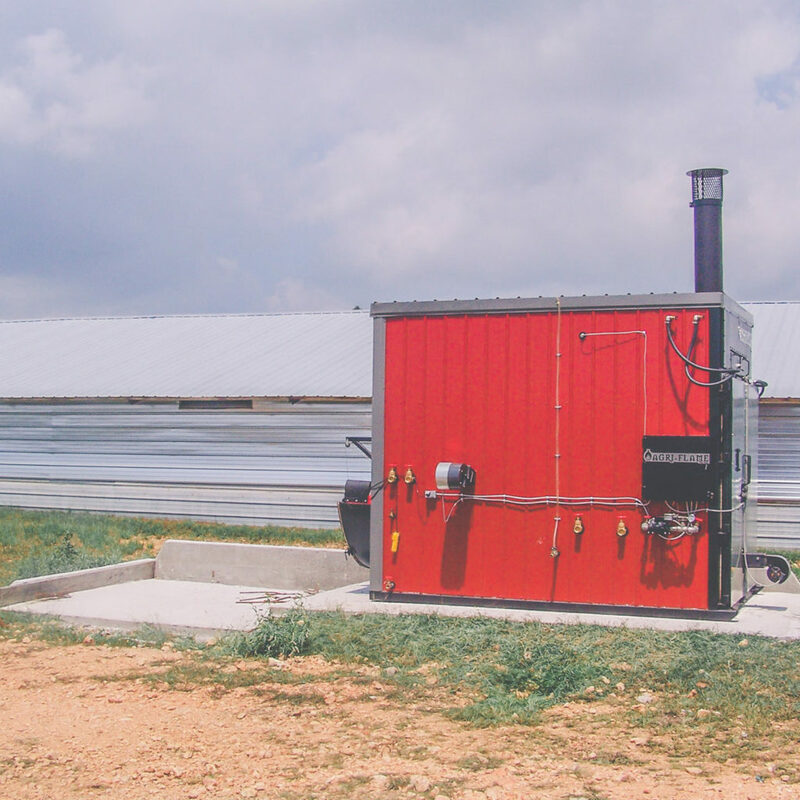 Since the AGRI-FLAME is designed for many applications, (chicken houses, turkey houses, hog operations, green houses, etc.) 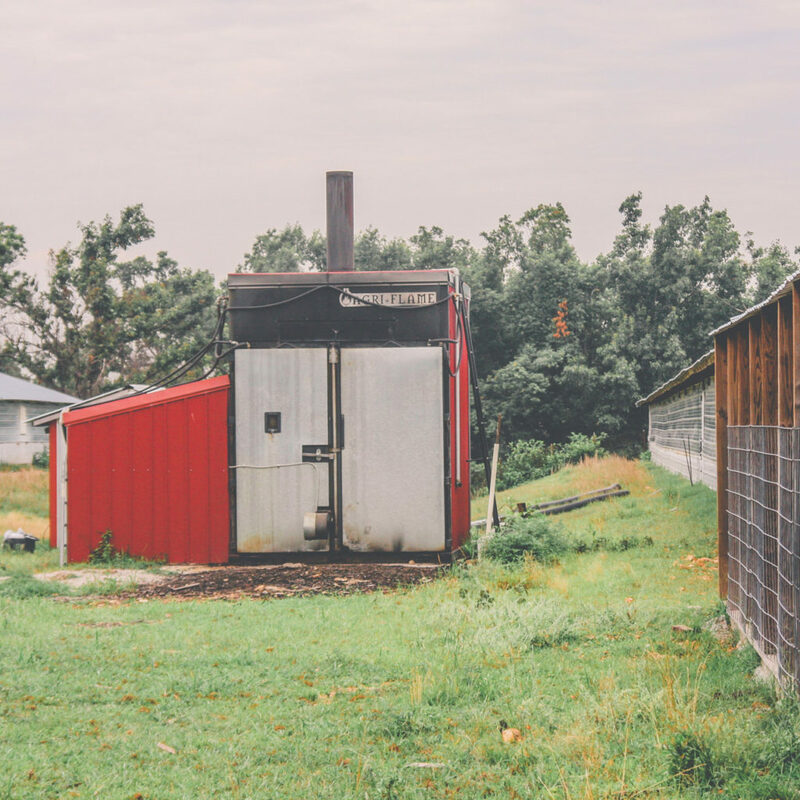 the best answer is that one AGRI-FLAME will significantly reduce the heating cost for up to 100,000 square feet (a normal six chicken house operation). What does an AGRI-FLAME cost? Due to rapidly changing steel costs, please contact B & D Heating Systems for a current price. Are there any government grants available to help with the cost of this type of system? Yes, a government grant is administered by various states and available through the US Department of Agriculture. After placing an order for and AGRI-FLAME, how soon can I expect delivery? Upon receiving the order and deposit, you can expect delivery in 4 to 6 weeks. 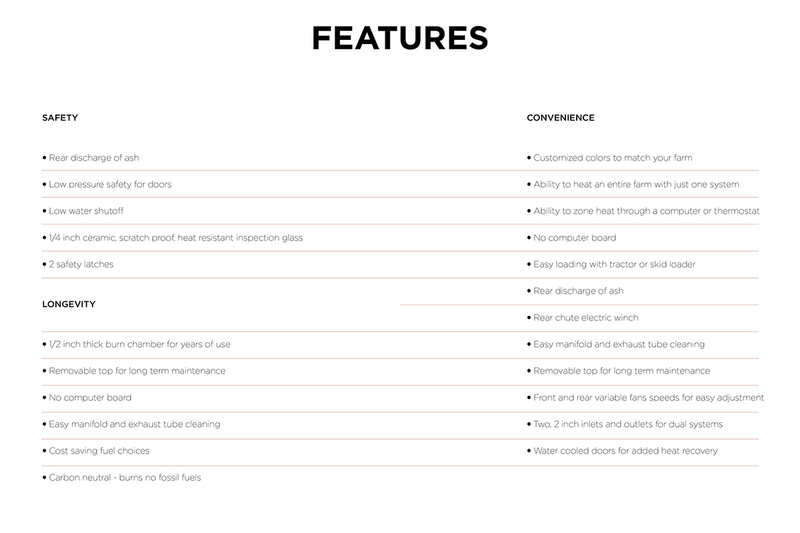 Other than the AGRI-FLAME stove, what components are needed for the complete system? A pump, underground insulated pipe, in-building piping, fan/radiator assemblies, various plumbing, valves, and electrical wiring are all needed. Do I have to delay or alter my flock placement schedule in order to install the system? No, with careful planning, all in-house installation can be completed between flocks. Do I have to heat the complete building when I am only using one or two zones? No, Heat can easily be controlled by zones. We would love to hear from you! If you have questions about the AGRI-FLAME or how to get started financing, please give us a call or email us using the information below!